While confirming a Thursday release date for Left 4 Dead 2's "The Passing" downloadable content, Valve also reveals "Mutations," featuring more than 20 new game modes rotated on a weekly basis, from "Realism Versus" to "Chainsaw Massacre." It's official: Left 4 Dead 2's The Passing will be out on Thursday, April 22 for the Xbox 360 and PC, and it's much more than a new episode, new infected, and a couple of new weapons. According to Valve, The Passing will also include a brand new way to play the game that'll keep players coming back every week for more. "Mutations," are a series of new game types that Valve will be cycling in and out of the game on a weekly basis. 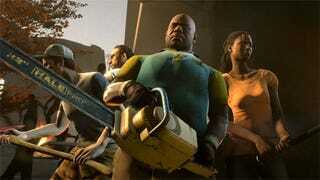 There are more than 20 different "Mutations" planned, including the aforementioned "Chainsaw Massacre," which arms players with chainsaws and an unlimited supply of gasoline. Now that's my kind of zombie slaughter right there. All new game modes will be playable on any of Left 4 Dead 2 campaigns, and will be exclusive to players that have purchased The Passing downloadable content. Purchased being a relative term, of course. Xbox 360 players can expect to pay 560 Microsoft points ($7) for The Passing, while PC players can purchase it for completely free, which I suppose doesn't count as purchasing it at all.